This site is a gathering place for Team 49 sailors to come together for information about the ship (her current disposition) and to catch up with old shipmates. Two items are available in our ship's store - Official USS Vincennes ball caps and the ship's crest patch. Both are available for a limited time only. Released on May 18, 2009, this book is about the four U.S. naval warships that carried the Vincennes was published. Documenting the careers of the four naval vessels that bore the name Vincennes, Freedom's Fortress stems from one sailor's passion for his ship and her history. In 1779, a Virginia frontiersman led a ragtag band of militia and Indians over miles of frozen and wet terrain to defeat a superior force of British garrisoned at a frontier outpost known as Fort Sackville in what would become the the city of Vincennes, Indiana. This small town and her American Revolutionary War battle would be represented by four naval warships, each writing their own chapter in U.S. history. From the United States Exploring Expedition and the discovery of the Antarctic continent to the service in the Civil War to World War II and the Persian Gulf, the importance of the name Vincennes is seldom seen in modern history books. 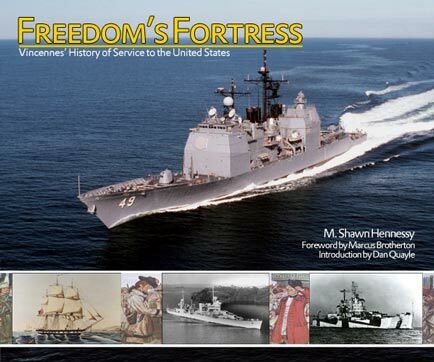 Freedom's Fortress attempts to set the record straight spotlighting each vessel's contribution to the American fabric. Order yours today! Reconnect with your Shipmates on Facebook! Copyright ©2000-2003 all rights reserved.